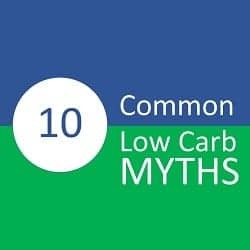 In my time interacting on social media (Facebook, Twitter) as the LCHF-Dietitian (@lchf-RD) I keep coming across many of the same misconceptions about eating a low carb diet, so I decided to write an article dispelling 10 of the most common myths. Firstly, as elaborated on in a previous article, a recent study published at the end of March 2018 in Nutrients looked at health and nutrition data from 158 countries worldwide and found that total fat and animal fat consumption were least associated with the risk of cardiovascular disease, so even if someone following a low carb diet chose to eat foods high in saturated fat, it does not mean they are necessarily at higher risk of heart attacks or strokes. Secondly, a low carb diet does not necessarily have to be high in saturated fat. In fact, it may have very little added fat at all such as when people are aiming to lose weight, so that they burn more of their own body fat. While there is no increased risk with eating the saturated fat that is naturally found in meat (chicken, beef, pork, etc. ), except for specific clinical requirements (for example, a ketogenic diet for epilepsy) there is no reason anyone has to add additional saturated fat. There are other sources of fat that are delicious and have beneficial properties, such as monounsaturated fats found naturally in olive oil and avocados and their oils. There are different types of low carb diets and a low carb diet may not necessarily have a lot of protein – whether as eggs, cheese, meat, or fish. In a very low carb (ketogenic) diet used for epilepsy, the diet is mostly fat and has low protein, however in a low carb diet used for weight loss and improving metabolic conditions such as Type 2 Diabetes or high blood pressure, the amount of protein will be moderate. How much protein is “too much”? The RDA for Protein is set at 56 gm per day (based on 0.8 g protein per kg of body weight) is the minimum amount to prevent deficiency. This is not the optimal amount, but the absolute minimum amount. So, whether a given person is eating 1200 calories a day or 2500 calories per day they have an absolute requirement for 56 gm of protein per day. The maximum amount of protein per day is set at ~200 g / day and is calculated based on >2.5 g protein per kg of body weight, and the range from 56 g to 200 g of protein per day is referred to as the range of safe intake. According to Dr. Donald Layman, Professor Emeritus of Human Nutrition from the University of Illinois, a high protein diet doesn’t start “until well above 170 g / day”. You can read more about this here. Everybody’s needs for protein is different and many people, especially adults and older adults are either not getting enough protein or it is mostly at dinner, with little at breakfast and lunch, which is a concern in older adults, as it puts them at risk for sarcopenia, the muscle wasting often seen in older adults eating a Westernized diet. You can read more about that here. In any case, most low carb diets aren’t anywhere near the level of what is considered a “high protein diet”, let alone “too high in protein”. Myth 3: “Low Carb Diets involve eating lots of meat”. 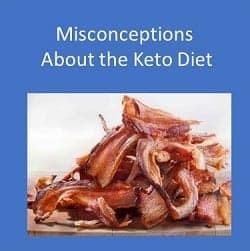 While there are some, especially those involved in the body-building or body-sculpting world that choose to follow a variation of a low-carb diet which involves eating lots of meat (and protein, in general), there are some variations of a low-carb diet that don’t involve eating meat at all. As mentioned above, ketogenic diets used for those with epilepsy or seizure disorder are mostly fat and ketogenic diets used as an adjunct therapy in treatment of specific types of cancer are often mostly fat, as well depending on the specific type of cancer. Therapeutic low carb or ketogenic diets used for weight loss or improving metabolic conditions such as Type 2 Diabetes, high blood pressure and abnormal cholesterol may be based on a moderate amount of protein, with some of that as meat if the individual eats it and enjoys it. To eat low-carb, there is no requirement to eat meat at all. A low carb diet can be designed to accommodate pescatarians (those that only eat fish), as well as vegetarians. There are even some vegans that choose to follow a low carb diet for a variety of reasons, although getting enough of all nutrients is a major challenge, just as it is for those following a Standard American/Canadian Diet. I’ve written an article about the range of foods that can be eaten on a low carb diet which can be read here. Myth 4: “Low carb diets are dangerous because the brain needs a certain amount of carbohydrate”. Except for erythrocytes (red blood cells) every cell in the body has mitochondria (the so-called “powerhouse of the cell”). The mitochondria can use a variety of fuel sources and turn it into Acetyl-CoA, which then enters the Kreb’s Cycle and generates Adenosine Triphosphate (ATP) which is what every cell in the body requires for life. The brain is no different than any other cell in the body that has mitochondria, as it can efficiently and safely use Acetyl-CoA can be made from carbohydrate (e.g. glucose), ketone bodies (a byproduct of fatty acid breakdown) and amino acids from protein to generate Acetyl-Coa. Most parts of the brain have no requirement for dietary carbohydrate, as it can use ketones generated from fat breakdown. Certain parts of the brain and red blood cells do need glucose (approximately 30 g a day) and that need is fulfilled by a process called gluconeogenesis where glucose is made by the liver and kidneys from substrates other than carbohydrate, including amino acids (from proteins) or glycerol (from fat breakdown). This does not mean that low carb diets contain no carbohydrate! As mentioned above, some liberal low carb diets have enough carbohydrate such that the person does not go into ketosis, while therapeutic ketogenic diets (done under medical supervision) such as those used for the management of epilepsy or as an adjunct to cancer treatment may have < 30 g of carbohydrate. Myth 5: “A Low carb diet is imbalanced and causes nutrient deficiencies”. With the exception of a therapeutic ketogenic diet for epilepsy or as an adjunct to cancer treatment, eating a well-formulated low-carb diet provides adequate nutrients, even those such as thiamine (vitamin B1) and folate which are normally associated with grain products. There are many low-carb sources of thiamine, including pork, chicken liver, macadamia nuts and peanuts, flax-seed and asparagus and just 1 serving of each of these can meet an adult’s daily requirement. Likewise, there are many low-carb sources of folate (vitamin B9), including the low carb leafy vegetables that are abundant in a well-formulated low carb diet, as well as other green vegetables such as asparagus, spinach, Brussels Sprouts and avocado. Vitamin C is plentiful in foods outside of citrus fruit, including red and green bell pepper, broccoli, cauliflower and strawberries, as well as in lemon and lime that can be used as a seasoning for salad dressing, fish or to flavour water. Calcium is easily obtained from well-designed meal plans that include cheese and yogurt, fish (such as sardines and canned salmon), almonds and leafy vegetables such as spinach, collards and kale. A well-designed low carb diet provides a wide range of foods; from cheese and other dairy products, nuts, seeds, fruit, low carb vegetables and meat, fish and poultry and can provide the essential nutrients that a healthy body requires, including vitamins and minerals. The only two nutrients that will likely be sub-optimal are vitamin D and magnesium– but are certainly not provided in lesser amounts than in the average Canadian or American diet. I advocate for supplementation of both of these nutrients, whether someone is following a Standard American or Canadian diet or a low-carb diet. Myth 6: “Low carb diets are so restrictive”. This is one of the two myths that I often joke about around the dinner table, because the food we eat is anything but restrictive. People can eat a huge variety of vegetables and meat, fish and poultry which require the minimum of cooking and food preparation so even for someone with little or no cooking skill or time to prepare food, a well-designed low carb diet is entirely possible. I design them for clients all the time, because many people fall into this category or live alone and don’t want to cook elaborate meals for themselves. For those that enjoy cooking and have the time to do it there are very few, if any traditional foods that can not be made low carb – and made very tasty! As can be easily seen in the recipes on this web page, as well as the article I wrote on what people can eat on a low carb diet, there is almost no recipe that can be adapted for those that choose to eat low carb. There is even rolls for sandwiches and several different types of pizza (to suit those who follow a higher fat low carb diet or a lower fat low carb diet). I invent the recipes for myself and share them on my webpage because food should not only be healthy, but enjoyable. Myth 7: “Low carb diets are not sustainable”. This is the second myth that makes me chuckle, because I know of people that have been eating this way for 15 or 20 years which in and by itself demonstrates it is quite sustainable. There are one-year and two-years studies on this web page the also indicate that a well designed low carb diet is quite sustainable. What is “not sustainable“ about eating fresh, healthy, whole foods that can be prepared with a minimum of cooking or as elaborate as one’s imagination allows? Myth 8: “Low carb diets require you to constantly count carbs and check your ketone levels”. First of all, a well-designed low carb Meal Plan does all the “carb counting” for you – all you need to do is decide what you want to eat. This is no different whether someone eats a moderate amount of carbs or a low amount of carbs. In fact, how foods are grouped on your Meal Plan, you’ll know how many carbs are in one serving any food in that group, should you want to add something to your Meal Plan. As far as checking ketones, unless one is on a low level of carbohydrates (ketogenic diet) and either has certain health conditions or taking specific medications, there is no need. Myth 9: “It doesn’t matter if you eat low carb or low fat, the only thing that matters is Calories In Calories Out”. This answer may stir up some controversy, because there is a wide range of opinion on this. Some advocates of a low-carb diet insist that Calories In Calories Out (CICO) is irrelevant because metabolism is different when one eats low carb. Some advocates of a low-fat diet will say that low-carb only works because in the end, people eat less calories. I think it is “both / and not “either / or”. Most low-fat diets are calorie-restricted diets and when calories are restricted, people’s metabolism slows down. That is why people following a carbohydrate-based low-calorie diet feel cold, tired and lethargic; because their body is conserving the calories it is getting for important metabolic functions. Because the body is primarily using carbohydrate as fuel, fat stores are only accessed when carbohydrate is restricted – which also slows down metabolism. When people are eating a diet that is low in carbohydrate and which has sufficient protein, and is higher in a variety of fats, people’s bodies are mainly using fat as fuel. If their Meal Plan is designed for weight loss, then some of the fat they are using for fuel is their own fat stores – so ‘fuel’ is never restricted. If the body needs more energy, it will take the “extra” it needs from fat stores. In this way, the body doesn’t have to slow metabolism to conserve energy, because there is always more fat in the person’s fat stores. Eating a diet based predominantly based on healthy fats and protein with much lower level of carbohydrates makes people feel full after eating much less, so the end result is that they generally eat less calories, which is why they are able to lose weight. That is, a calorie is still a calorie but all fuels are not considered equal. Unfortunately, this is way too common a myth – even one in which some healthcare professionals are confused. Ketones are naturally produced in our bodies during periods of low carb intake, in periods of fasting for religious or medical tests, and during periods of prolonged intense exercise. This state is called ketosis. It is normal and natural and something everyone’s body does when using fat as its main fuel source. Once our glycogen levels are used up, fat is broken down for energy and ketone bodies are a byproduct of that. These ketones enter into the mitochondria of the cell and are used to generate energy (as ATP) to fuel our cells. Ketosis is a normal, physiological state and we may produce ketones after sleeping all night, if we haven’t gotten up and eating something in the middle of the night. Ketoacidosis on the other hand is a serious medical state that can occur inuntreated or inadequately treated Type 1 Diabetics, where the beta cells of the pancreas don’t produce insulin. It may also occur in those with Type 2 Diabetes who decrease their insulin too quickly or who are taking other kinds of medication to control their blood sugars. In inadequate management of Type 1 Diabetes or in insulin-dependent Type 2 Diabetes, ketones production will be the first stage in ketoacidosis. This is not the case when the above medical issues are not present. There are a wide range of low-carb diets with various levels of carbohydrate, protein and fat. Some are high in meat, others low in meat, while others have no meat at all. Some are very high in protein and others are very high in fat. Some promote weight loss, others make it very difficult. There are different types of low carb diets because they are used for different purposes. Each person’s requirement for protein is different, so following a generic “low carb diet” downloaded from the internet will be based on an ‘average’ amount of protein for adults and not your needs . The amount of fat you will be encourage to eat will be based around the protein needs that are set by the web page. If you are wanting to lose weight, very often you may find that you lose a bit at first and then weight plateaus for extended periods of time. Many of my clients come to me after trying this approach, feeling that a “low carb diet doesn’t work for me”. The issue very often is that the plan wasn’t designed for “them” at all. Most general types of “low carb diets or plans” allow people to select the level of carbohydrate they want to limit. Often, people will choose a ketogenic level because they want to lose weight quickly, with little regard for making sure they are getting sufficient nutrients. For everyone who does not fall into the above category, it’s important to realize that there is a very big difference between a generic meal plan downloaded from a “low-carb” website and one designed just for you, based on your physiological needs and ensuring that you get adequate nutrients based on your own medical history and family risk factors. For a low-carb style diet to provide the nutrients that you need for your age, gender and activity level, it needs to be designed for you; factoring in your need for specific nutrients. It’s not simply a matter of choosing a level of “macronutrients” (“macros”) such as carbohydrate, fat and protein, but ensuring adequate “micronutrients”, too. That is the difference between having an Individual Meal Plan designed specifically for you by a knowledgable Registered Dietitian and one that is based on general cutoff points. For this to be a way of eating that is balanced in terms of overall nutrients and will meet specific health goals and which is healthy and interesting enough to be sustainable over the long term, it needs to be carefully designed for each individual. Do you have questions about how I can help design a Meal Plan for you? Or for you and your partner? Please send me a note using the Contact Me form located on the tab above and I will reply shortly. Alarming social media posts cry out dire warnings about the supposed “dangers” of the ‘keto diet’ but are they founded? What is “the keto diet”? There is no one “keto diet”, but many variations of ketogenic diets that are used for different therapeutic purposes. Some therapeutic ketogenic diets are used in the treatment of epilepsy and seizure disorder and are extremely high in fat. Other types of therapeutic ketogenic diets are used in the treatment of various forms of cancer (those that feed on glucose), such as brain cancer. There are ketogenic diets that are used in the treatment of Polycystic Ovarian Syndrome (PCOS), as well as for weight loss and for increasing insulin sensitivity in those with Type 2 Diabetes and insulin resistance. Even among those using a nutritional ketogenic diet for weight loss and to increase insulin sensitivity, there is no one “keto diet”. There are ketogenic diets with a higher percentage of fat than protein, with a higher percentage of protein than fat and mixed approaches which may have different ratios of protein to fat – depending on whether the individual is in a weight loss phase or a weight maintenance phase. There are as many permutations and combinations as there are people following a keto diet for these reasons. What makes a diet ketogenic (or keto) is that the amount of carbohydrate relative to the amount of protein and fat results in the utilization of fat as a primary fuel source rather than carbohydrate. Another assumption is that a keto diet used for weight loss (as if there were only one?) is 20% protein, 70% fat and 10% carbohydrate (and such posts are often accompanied by photos of large plates piled high with bacon and eggs), however therapeutic ketogenic diets used for weight loss ranges from those with a higher percentage of fat than protein (which may focus on mono-unsaturated fats and omega 3 fats), a higher percentage of protein than fat (thus no piles of bacon! ), and a mixed approach with different ratios of protein to fat depending on whether the individual is in a weight loss phase or a weight maintenance phase. This idea that a “keto diet” has a specific percentage of fat to protein to carbs in itself is very confusing, because the percentage of calories of any of these macronutrients will depend on how many calories a person is eating in a day. For example, two different people may be eating ~30% of their calories as protein but one person is eating just over 55 gm of protein on an 800 calorie a day diet, while another person is eating 160 gm of protein on a 2000 calories diet. When discussing macronutrients, we have to specify grams of protein, grams of fat and grams of carbohydrate, otherwise the figures are meaningless. 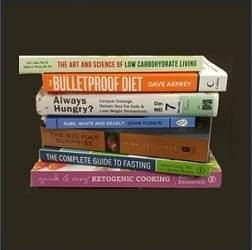 What makes a diet ketogenic is that the amount of carbohydrate in the diet results in people’s body utilizing fat as its primary fuel and depending on the individual, how insulin resistant (IR) they are, how long they have been IR or had Type 2 Diabetes and whether they are male or female will affect the degree of carbohydrate restriction. Some may do very well with 100 gms of carbohydrate, while others may need to consume less. Not everyone with lactose intolerance for example, needs to restrict milk to the same degree; some can tolerate 1 or 2 cups whereas other can only tolerate a few ounces. It is the same case with those that have become intolerant to carbohydrate. Different individuals depending on their metabolic state and clinical conditions, have varying ability to process carbohydrate. That is why there is no “one size fits all” ketogenic diet. Some articles warn that “ketosis is actually a mild form of ketoacidosis” which is simply not true. Ketones are naturally produced in our bodies during periods of low carb intake, in periods of fasting for religious or medical tests, and during periods of prolonged intense exercise. This state is called ketosis. It is normal and natural and something everyone’s body does when using glucose as its main fuel source. There is no one “keto diet” but rather many variations of ketogenic diets that are used for different therapeutic purposes. Depending on the condition for which a person is using a therapeutic ketogenic diet, the number of grams of fat, protein and carbohydrate will vary. Even in those utilizing a ketogenic diet for weight loss or lowing insulin resistance, the number of grams of carbohydrate will vary considerably person to person. People following a ketogenic diet need to work closely with their doctor. 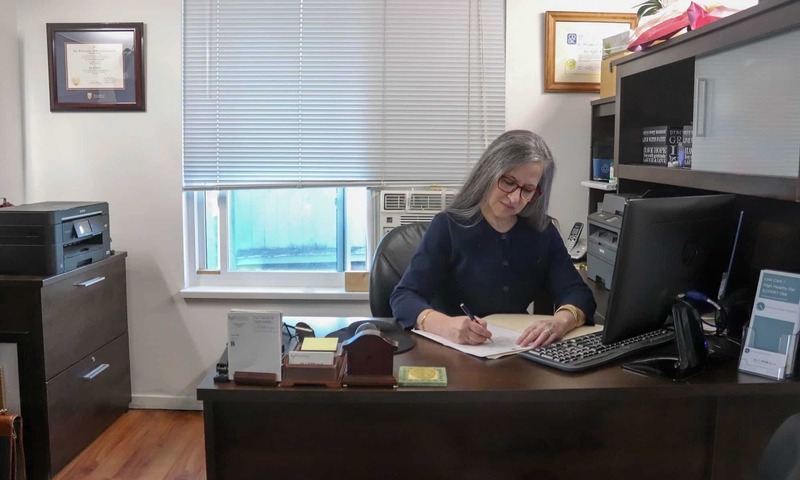 For those on blood sugar- or blood pressure lowering medication this is very important, because clinical studies have demonstrated that the dosage of medication needs to be adjusted downwards as glycemic control is restored. As with anything we read in magazines or on the internet, a healthy dose of discernment is needed. The person writing the article may not be current with the research in this field and be sincerely operating on an older paradigm. I encourage you to ask questions, read reviews of current studies using ketogenic diet for the condition of relevance (whether on this site or others) and to speak with your doctor. Let your decision will be an informed one, not fueled by dramatic headline with dire warnings and misinformation.